Temperament: Pit Bull Terriers have a natural tendency of aggression toward other dogs and animals but not people. If properly socialized, the aggressive tendencies of a Pit Bull Terrier can be diminished. Pit Bull Terriers make good companions if trained properly. Pit Bull Terriers are extremely loyal and good-natured dogs. They make good family pets. Family Dog: Pit Bull Terriers are good-natured dogs that make great family pets. Pit Bull Terriers are not generally good for families with other pets, unless they are raised together from a young age. They were originally called the nanny dog in England because of their attentiveness to children. Shedding: Pit Bull Terriers are average shedders. Grooming: Pit Bull Terriers should be brushed regularly. A firm bristle brush will do best. They should be bathed or dry shampooed as necessary. Training: Pit Bull Terriers are obedient and eager to please dogs. A properly trained Pit Bull Terrier will be a well behaved and tranquil. Pit Bull Terriers should be well-socialized at a very young age to combat their aggressive tendencies. Behavior: The American Pit Bull Terrier should not be aggressive towards people. They should accept unknown people as friends. They do have a tendency to chew and to grasp and pull and not let go. This is not a sign that they will bite or be aggressive it is a breed trait. Weather: Pit Bull Terriers do best in a warm climate. Exercise: The American Pit Bull Terrier is a very energetic and athletic dog that will need regular exercise and walks. Living Conditions: Pit Bull Terriers will do best in a house with a large yard. They will do okay in an apartment if properly exercised indoors. Appearance: American Pit Bull Terriers have a powerful, muscular, naturally toned, athletic appearance. Pit Bull Terriers have a brick-like head that is broad between the cheeks. The neck is muscular and well-defined. The American Pit Bull Terrier is a stocky, muscular dog that is surprisingly agile for their size. 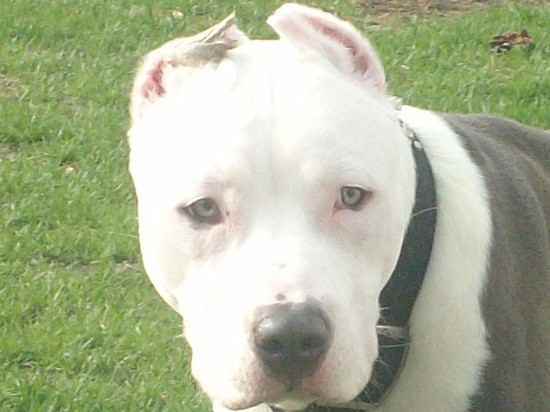 The Pit Bull Terrier's ears are usually cropped. Their tails should tapers to a point and not be docked according to standards. The Pit Bull Terrier's eyes are round and can be any color. The Pit Bull Terrier should have a scissors bite. The coat contains short, thick fur with a glossy finish. The Pit Bull Terrier can be any color. Size: The weight of Pit Bull Terriers can range from 22 pounds to 110 pounds which is rare. Most commonly, Pit Bull Terriers are between 35 to 55 pounds. Their height can range from 18 to 22 inches. Companionship: American Pit Bull Terriers are the best companion dog. They are totally and completely loyal and loving. Color: All color variations are accepted in the American Pit Bull Terrier's coat. Coat: Pit Bull Terriers have a short, smooth, soft Terrier coat. Life Expectancy: The average life expectancy of a Pit Bull Terrier is about 12 years. Characteristics: Pit Bull Terriers are extremely courageous and intelligent dogs. They make great guard dogs. Pit Bull Terriers are highly protective their owners. Celebrity Owners: Rachel Ray, Jack Dempsy, Teddy Roosevelt and Jack Johnson are a few celebrity Pit Bull Terrier owners. Allergies: American Pit Bull Terriers are prone to having an allergy to grass. They also have very sensitive skin. Health: Pit Bull Terriers are generally healthy breed. They have some tendency toward hip dysplasia, hereditary cataracts and congenital heart disease. Litter Size: The average litter size of the American Pit Bull Terrier is 5 to 10 pups. History: Pit Bull Terriers were originally used as fighting dogs. They were developed from the Bull and Terrier types.